Lake Arenal sits beneath the majestic Arenal Volcano in the northern part of Costa Rica. It is 85 square kilometers, man-made and is 30 to 60 meters deep, depending on the season. It is the biggest lake in Costa Rica provides essential hydroelectric power generation for the country. There are two fish species that live in the lake, the machaca and the famous rainbow bass, making it a popular fishing destination. Over 100 other mammals survive thanks to the lake’s water supply. Go hiking around the lake and you’ll spot hundreds of bird species, tapirs and maybe even a jaguar (unlikely, but jaguars do live off of the lake). Paddleboarding, windsurfing and kayaking are very popular among tourists and locals. Between November and April you’ll see a higher number of windsurfers and kitesurfers thanks to the strong, consistent winds that blow over the beautiful lake. 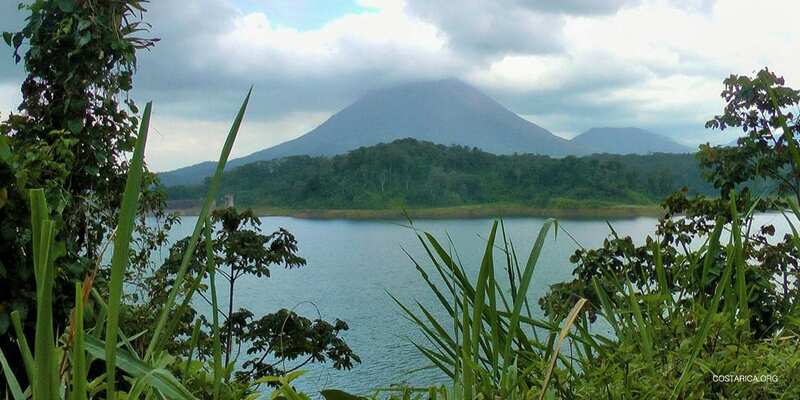 From 1972 to 1976, a huge earthen dam was built, resulting in the creation of Lake Arenal. Once the hydroelectric dam was finished in 1979, Lake Arenal was 3 times bigger than it was originally. There are two abandoned cities at the bottom of the lake that were moved to east side during construction of the dam. The deepest part of the lake is 180 feet deep. However, the depth adjusts throughout the year, and when the lake is shallower, you can see some islands appear. The massive Arenal Volcano and lush rolling hills in the background, along with the shining blue waters, make Lake Arenal an incredible area for water and adventure activities, hiking, horseback riding, wildlife spotting and photography. The surrounding hotels, spas, hot springs and tourist towns make Lake Arenal and the Arenal Volcano one of the most popular tourist destinations in Costa Rica. Don’t skip this area on your next Costa Rica vacation! Have you ever dreamt of kayaking under a volcano? Maybe not, but on Lake Arenal, you can! The lake is the perfect place for water activities. Kayaking, paddle boarding and windsurfing are the most popular. In fact, Lake Arenal is one of the most loved windsurfing destinations in the country. You can also take a boat ride or sunset dinner cruises around the lake for unbeatable views from the calm lake water. Thanks to the healthy population of rainbow bass (guapote) living in the lake, sport fishing is quite popular. The tricky fish are hard to catch, which makes fishing a fun challenge. Go fishing at sunrise and sunset for the best luck! The Arenal Volcano National Park covers almost 30,000 acres and is incredibly geologically and biologically wealthy. In addition to hiking through the national park beneath the volcano, you can also go on an adventure tour! Different adventure tours include horseback riding, rafting down the nearby rivers, zip lining mountain biking, bird watching and even an ATV tour. Exploring the national park is a great way to learn about the volcano and spot wildlife. La Fortuna de San Carlos is a small town about 3 hours away from San Jose and only 10 kilometers from the Arenal Volcano. It conveniently connects the Arenal Volcano with the Monteverde Cloud Forest, and the Santa Elena Cloud Forest. Thanks to its proximity to the volcano, lake and local hot springs, La Fortuna is very popular. You’ll find some of the best hotels and spas in the area with amazing volcano views. For incredible volcano and mountain views, visit the tiny town of Nuevo Arenal on the north east side of Lake Arenal. You can get to the town through La Fortuna. The town was built in 1973, the same time as the dam. When “old” Arenal was flooded, Nuevo Arenal was built 620 meters above sea level. It’s a great place to experience small town culture and even some active nightlife. Don’t forget to stop by the Arenal Botanical Gardens! It has over 1200 tropical Costa Rican plants. Lake Arenal is one of the most popular destinations in Costa Rica. It gets really busy, so be sure to make your reservations as early as possible, especially if you want a lake view! This 75 meter waterfall is just a short drive from La Fortuna and makes for a great day trip! The Fortuna Waterfall is perfect for families because the hiking trails are well-kept and easily accessible. 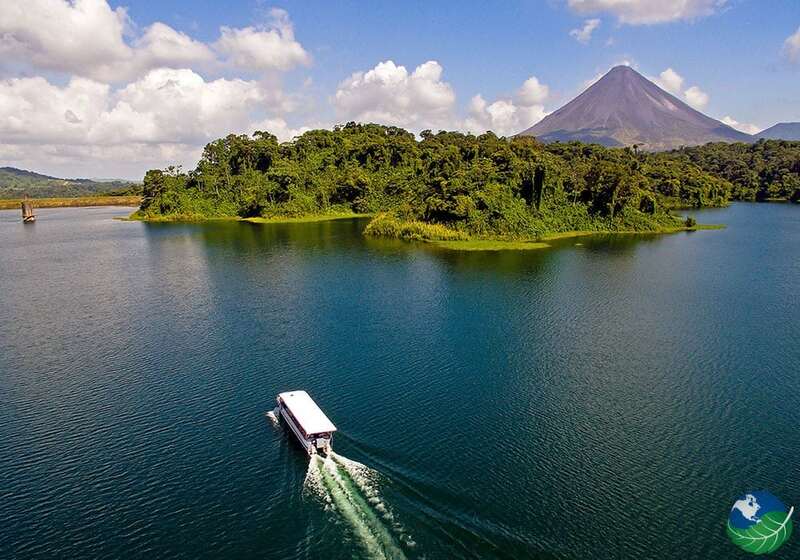 There is so much natural beauty surrounding Lake Arenal and you’ll want to capture it all! If you’re looking for an amazing Lake Arenal hotel, surrounded by a lush rainforest and panoramic views of the volcano lake, you will not be disappointed! For incredible luxury, stay at the Nayara Springs Resort and Spa. For an eco-friendly lodge, try the Arenal Observatory Lodge. You’ll be immersed in flora and fauna and have access to various hiking trails. The Tabacon Resort and Spa is another beautiful location. It offers direct access to their thermal hot springs for ultimate relaxation. You can get to Lake Arenal through La Fortuna or Nuevo Arenal. You’ll take route 142. You can get there in private transfer, shared shuttle or rental car. During the rainy season you will need 4-wheel drive. If you’re renting a car, making sure to read about driving in Costa Rica and beware that the roads to Arenal are windy and hilly.